No fewer than 12,000 young Nigerians are in prisons or stranded in different parts of North African country, Libya. The National Commission for Refugees, Migrants and Internally Displaced Persons (NCRMI) has confirmed and said that 3,887 have been deported since February this year. Eight days after 149 Nigerians voluntarily returned from Libya, another batch of 258 were received in Lagos on Tuesday night. They were deported from the North African country where they had been stranded enroute Europe. The returnees were brought back aboard a Libyan Airlines aircraft with Registration Number 5A-LAU. The Airbus 330-200 aircraft touched down at the Cargo Wing of the Murtala Muhammed International Airport, Lagos at about 8.45pm on Tuesday. No fewer than 149 Nigerians had on Nov. 6 returned from Libya. “These young Nigerians, mostly girls from age 14, were received in different weeks during the period. 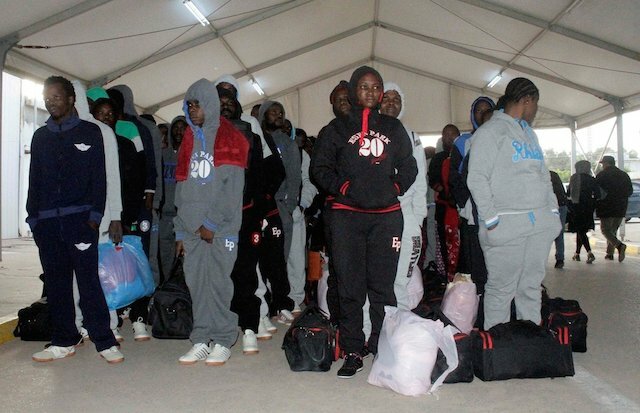 “We have found out that the IOM, European Union (EU), Dutch and Swiss governments are involved in the deportation of these Nigerians from Libya,’’ she said. She said that some of the young people returned with pregnancy. According to her, there are more than 12,000 young Nigerians in prisons or stranded in different parts of Libya.